Do you want to make cleaning easier and dream of the day someone or something will solve all of your messy problems? Of course you do. Today's products and cleaning tools are so much better than they used to be with new innovations hitting the market nearly daily to make life easier. And the internet is filled with hacks and tips that lure us in with visions of better and effortless cleaning. Who thinks of these things and why haven't we seen them sooner? Some are based on a bit of science, but most are not. Here are eight cleaning hacks that don't work and will just waste your time and money. Some are even flat out dangerous! Skip 'em and follow the saner advice that will give you a much cleaner and safer outcome. Like many hacks, this one is based on a bit of science. Yes, high heat can kill some bacteria. However, the length of time needed in a microwave to reach the desired temperature to kill all the bacteria lurking in the center of a sponge will result in a flaming, incinerated sponge. 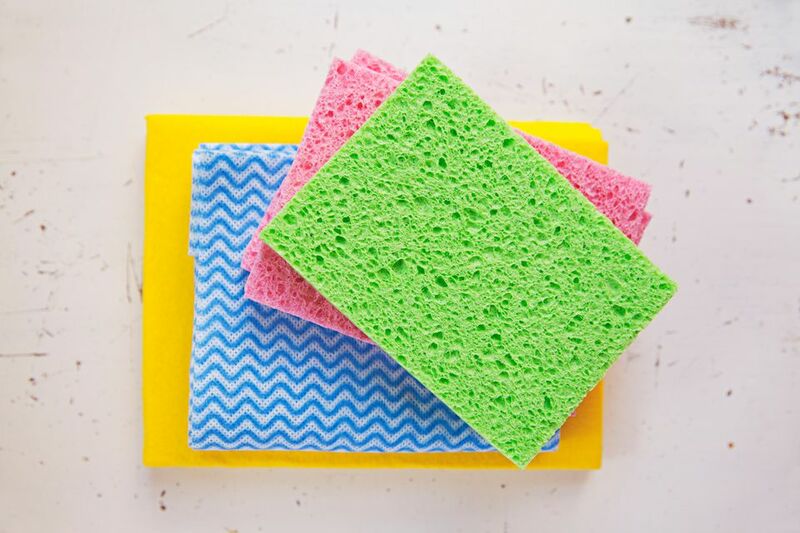 New studies show that nuked sponges still harbor about 40% of their bacteria, some of which can be life-threatening. A better choice is to use disposable wipes or cotton or microfiber cloths that can be tossed in the washer after every use. Save the salt for your fries and skip putting it in the washer. By the time clothes get into stores for you to buy, it's too late to stop dye bleeding. That process has to be done while the fabric is being manufactured. Fortunately, if all of your underwear is now pink, there are some useful hacks that might just save the day. This is an oldie but a goodie hack that used to work when hairspray was nearly 100% alcohol. But times have changed. Today's hairsprays contain less alcohol (which is the magic ink remover) and more conditioners, oils, and emollients. Save the hairspray for your updo and grab the isopropyl alcohol instead. Yes, those little white erasers are magic at removing soap scum on bathtubs and crayon marks on walls. But they do nothing in your toilet tank to clean your toilet and may even screw up the flushing mechanisms. The scrubbers are made of melamine foam and need your elbow action to work. They don't dissolve and contain no bacteria killing or dirt-lifting components. Grease and food spatters can be hard to remove from cooktops; especially if they are crusty from weeks of high heat. While a coating of car wax might make the mess easier to wipe away, it can also cause a fire. If you have a boil-over, stick with prompt cleaning and a product that cuts through grease. Hot water can kill some bacteria, but it has to be really hot (212 degrees F) and the contaminated surface must be exposed for several minutes. Since most home hot water heaters are set at 120 degrees F, you're fooling yourself about expecting hot water alone to kill germs. After the flu sweeps through your home or you prepare raw meats in the kitchen, add a disinfectant like chlorine bleach, pine oil, or phenolic solutions (Lysol) to your cleaning routine. Can you clean a toilet with Coca Cola (or any carbonated soda)? Yes. Should you? No. Most carbonated sodas contain small quantities of citric and phosphoric acids that are effective in slowly removing rust and some stains. However, a liter of soda will do nothing to kill bacteria and leaves a sticky residue that might just provide food for bacteria growth. Stick with disinfecting toilet cleaners, they're better and cheaper per use. More is not always better when it comes to cleaning laundry or dirty floors. Adding extra detergent and cleaners makes it harder to rinse away and remove all the sticky residue. If that residue is left in fabrics or on the surface of your carpet or kitchen floor, it works as a dirt magnet. Fabrics turn dull and floors attract soil more quickly. Instead of adding more, choose the best quality cleaner for the job, read the directions, and measure appropriately. An extra bonus, you'll save money and make fewer trips to the store.